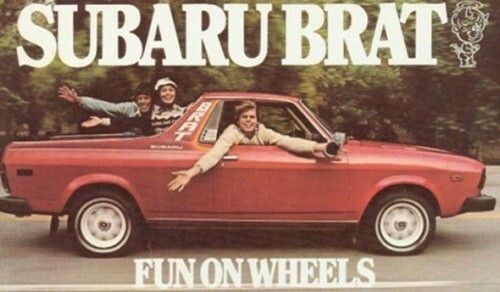 Listed below are the key features and specifications for the Subaru BRAT. The listed data is for stock BRATs and could be different on any used model as BRAT owners have been known to modify and customize them. The BRAT’s drivetrain was designed with weight and versatility in mind to target both rural users along with off-road enthusiasts. The initial engine offered was a 1.6-liter EA-71 horizontally opposed four-cylinder engine making 67 horsepower. This was quickly replaced during the 1982 design update with a 1.8L EA-81 increasing the hp to 73. (These updated BRAT’s are easy to spot because the rounded headlights were replaced with rectangular ones). A popalar version of the BRAT was made available as an option for 1983 and 1984 model years which featured a 94hp turbocharged STI engine. The turbo engine model was also where 3-spd auto transmission models can be found as the 4-spd manual was standard with all other BRATs. A single-range transfer case was used throughout the BRAT’s production however a dual range t-case was offered with later and GL models. Is it possible to (convert/replace) a 1979 Brat 1.6-liter EA-71 horizontally opposed four-cylinder engine making 67 horsepower with a 94hp turbocharged STI engine without changing the transmission ? It is definately not an “STi” engine. The STi engines didnt come into play until the EJ series of engines and the WRX STi wasnt available until early 2000’s the closest thing before that was the impreza RS. Im sure its stated here as such because its turbocharged. its possible to do but if the money isnt a problem swapping to an EJ series motor would jack the horsepower up more than the EA81 would.